The United States Mint today announced the release date for this year’s 5 ounce .999 fine America the Beautiful Silver Bullion Coins®. It also revealed that collector uncirculated versions would be available, and the mintage splits for each 2010 coin. The investment-grade bullion coins will be released on Monday, December 6, 2010. Each of the five 2010 America the Beautiful Bullion Coins will have a maximum mintage of 33,000 for a combined production run of 165,000. 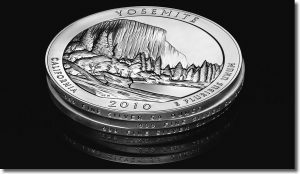 US Mint Director Ed Moy during a coin forum in February had suggested the possibility that numismatic versions of the America the Beautiful Silver Coins would be made available to collectors as well. The possibility became an official reality today as the US Mint confirmed it would offer America the Beautiful 5 ounce Uncirculated Coins. However, while the collector coins will be produced this year, they will not go on sale until the first quarter of 2011. Each uncirculated silver coin will have a maximum mintage of 27,000, representing a combined 135,000 mintage across all five 2010 coins. Adding the numbers, 300,000 of the 2010 America the Beautiful Silver Coins will be produced this year. That is down from the 500,000 the US Mint anticipated making earlier this year. It is expected that buyers will leap at the opportunity to grab all 300,000. Anticipation is already building for their release. The US Mint noted as much in a memo today to its network of Authorized Purchasers. "Because the United States Mint was only able to produce and make available a limited quantity of each these silver bullion coins in the relatively short period since the authorizing legislation was approved, we anticipate that demand for these coins will be significant." The America the Beautiful Silver Coins Program is similar to the America the Beautiful Quarters® Program. Both series share the same designs and each honor national parks or other national sites within the United States and its territories, as mandated by Public Law 110-456. 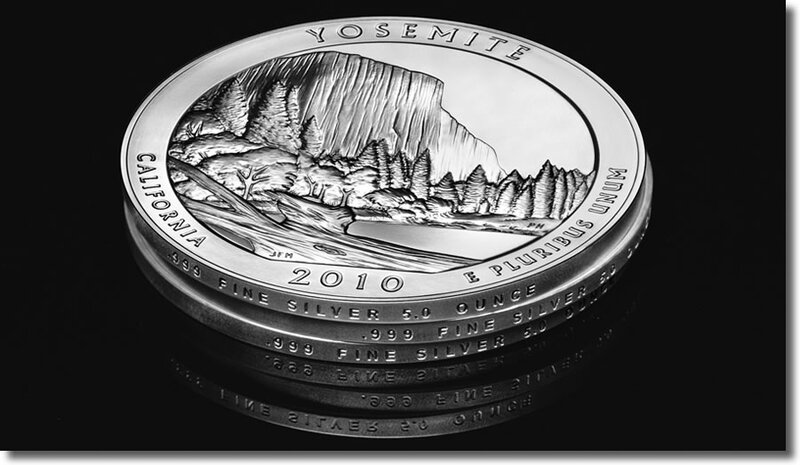 America the Beautiful Silver Coins feature incused edges of ‘.999 FINE SILVER 5.0 OUNCE’. The silver coins are much more prominent than the quarters, however, because of their diameter, silver composition and edge letterings denoting their .999 fine fineness and 5 ounce weight. They are also more detailed. "Feature-wise, the designs are identical, however, the relief on the 3-inch bullion coin is reduced because of the ratio of the thickness to diameter is lower on the bullion coin," U.S. Mint spokesman Michael White explained in October. "More detail will be present on the 3 inch since each work die is engraved and not hubbed. The hubbing process (used on standard coins like the quarters) softens the design and removes detail." There will be 56 different coin designs from 2010 to 2021. There are several notable differences between the investment-grade America the Beautiful Silver Bullion Coins and the collector uncirculated versions. The bullion version, like its American Eagle Bullion Coin counterparts, will have no mintmark. The numismatic version will have an uncirculated finish and feature the “P” mintmark denoting its production at the Philadelphia Mint. The coins are also distributed differently. The US Mint does not offer bullion products directly to the public but instead uses a network of authorized dealers who buy bullion coins in bulk and then resell them. These buyers will purchase the 5 ounce coins beginning on December 6 in quantities of 10,000 ounces/2,000 coins. They will pay the spot price of silver, plus an extra US Mint premium of $9.75 per coin. (Authorized Purchasers are charged a $2 premium for each American Eagle Silver Bullion Coin.) They will then offer the coins to the public for "as narrow a spread between buy and sell prices as prudent business judgment permits" and "in a manner which ensures that that they will be available, accessible, and affordable to all members of the public." The US Mint will directly sell the 5 ounce uncirculated coins to the public through its website and call center. Their premiums will be significantly higher than those of the bullion coins, which is typical for all collector products. Prices have not yet been announced. keep me posted when they will be available. 5 ounce sillver coins. Maybe they’ll be under $200…. Please Keep me post as to when the coin are available and there price. Less than a million ounces in total for the entire 2010 series? With over 30,000,000 bullion 2010 silver Eagles already sold. I agree. $1400.00 is way more than I anticipated. APMEX is seeing what the market will bear. Any other places to check prices? Some ebay lists show $1735, which is even more expensive. Would like to wait out for the mint version. The collector version is in unc condition, so the Mint premium should be lower (compared to the proof condition). The bullion version price may hold on for a while, but you can certainly get a better deal from the mint next year (like what happened to the the 2009 Lincoln silver coin and chronicle set). This is, clearly, not happening! The price AMPEX wants is pure GREED given what their actual cost is. I’m waiting for the collector version and can only hope the price of silver falls so that so of the “greedy” have to take a “Bath”! I was able to purchase a 5-coin set (12-6) from a dealer for $1,500, way more than I had anticipated! But I felt lucky to obtain them especially when my 2nd source asked for $2,195. Five coins off the market for a very long time… I honestly don’t think I will lose on this investment! At least it won’t be like my numerous other purchases (flat screen TVs, laptops, cell phones) only to be replaced with bigger and better versions for total losses. Silver at 30 year high today breaking $30/oz. barrier. WOW !!! What a Secondary Market, right out of the chute ! A real “bargain”, NOT ! What a boon for the ” Authorized Marketers” endorsed by the Mint. So, where can I get them right now? I understand that the Mint has STOPED the distribution of the 5oz bullion through their dealers for now. I hope they CANCEL their dealers orders and sell directly them to the public. That would certain stop all the “GREED” that has been shown with the high markups. It would also messup the dealers who would have to REFUND all the money they have taken without having the product available to ship. It would also be a leason on how NOT to buy from someone who doesn’t have what their selling on hand! One can only hope! Well, the US Mint pulled the plug on deliveries… waiting to do what? I don’t blame my dealer; this is 100% the fault of the US mint for not making enough of the coin sets to begin with and explicitly setting the price guidelines beforehand. The mint cannot honestly say “that they will be available, accessible, and affordable to all members of the public” by cutting the small run even smaller at 33,000 sets. Basically that is only 0.01% of the US population even if they could afford it! This small quantity, along with the production delays and surge in PM prices is just asking for a supply-and-demand fiasco. The oxymoron (with the emphasis on “moron” for the US Mint) is if it isn’t rare no one would bother collecting it, why not just buy bullion bars instead? Happy hunting and good luck with your orders! Does anyone have a list of the authorized dealers who can/will be selling these? Or do you know how I can find out who they are? Thank you. Hook Me UP 5 Ounce Baby , I am ready !! Did anyone else happen to catch the sale of the 5 pcs set on a Home Shopping Network,last week? Their coin supplier had the set “graded” MS69 on sale for $4,799.95. They also offer the 5 oz bullion for sale on a single basis for $1,199.95 each. Wrong on so many levels!! HSN is a rip off and anyone that buys any coins from them is a fool. I find most items they sell on Ebay exactly the same products from 100% rated sellers at 40%-50% less. The AMB program is ripping off the consumers and U.S. Goverment with no benefit to the National Park Service. Looks Like everything in the 5 oz. ATB will be on the secondary & tertiary markets. The authorized purchasers have stopped selling since the Mint weighed in and are now just holding the coins. They will not even take questions. I thought a distributor was supposed to distribute. Most authorized purchaser websites state they are determining how to comply with the Mint’s directions. That is odd – the instructions are very straightforward. Might they be trying to figure out how to get around the instructions? Regardless, as with anything related to the Mint citizens will pay through the nose. It was interesting that the Home Shopping Network had 120 sets of the 5 oz silver coins for sale on the evening of January 5th (for $5000 a set). I called the Mint and was told if I wanted to complain to call (202) 354-7500. There was a recording but you could leave a message. 5 oz. ATB coins will go in my collection if the price is right from the Mint “only”, anyone who watches the HSN for coin collecting just do what i do. I laugh at the “Fat Man” and his partner in crime for telling me lies to my face on TV to get a 100% profit on coins. My friend and I also called today. I got through after 20 minutes and got a set. My friend wasn’t so lucky. I used two phones and he, his cell, as we called for the next hour and forty minutes to no avail. However, I decided to keep trying for a few minutes after five o’clock and EUREKA!, at three past five I got through and got my friend a set. Tenacity won the day. The sets are $1100.00, payable by check, with a delivery date of no later than three weeks. I tried for about an hour, then again from 4:30 til 5:30pm, busy, busy, busy!! I tried about 7:00 pm EST and received a recorded message that said to check back during 2nd quarter on their new website: atb.cntofma.com, orders will only be taken on the website for the 2010 ATB 5 piece coin set. I guess they will have more to tell later. I had three phones (my land line and two cell) in my hands and was lucky to get through within 4 mins after 3:00 pm. Our neighbours tried the entire 2 hour period, even got me and my kids to help dial. Nada. It was all about luck that day. Curious to see the quality of the CNT coins! BTW, the well for the Ebay flippers seems to be drying out. Some sets are being sold for around $1350. Thanks Leo the that update, time will tell. I wonder how long it will take before they AP’s start selling to the public? If they can order the first 2 of the 2011 on Monday 4/25.